Here there is no scenario of bad blood or daggers drawn. It is a perfect picture of communal amity between Hindus and Muslims at Joybhum Kamakhya Temple near West Goalpara in Assam. The temple located near Chunari and Boguan of West Goalpara in Lower Assam has begun this year’s Durga Puja on a very positive note. 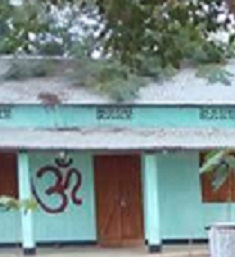 The temple is surrounded on all sides by the Bengali Muslims and except for the family of the temple priest there is no other Hindu family residing in and around that area. “We the Muslim people help celebrate Durga Puja in the temple every year and arrange everything for the purpose including collecting donations,” informed Abdul Kader Khandakar, a retired headmaster of Joybhum Kamakhyabari High school who started the practice of organising Durga Puja. The Joybhum Kamakhya temple is one among the 51 Shakti Peeths of the country. It is believed that the navel of Sati dropped here. Legend has it that the Zamindar of Lakhipur Mespara Prithiram Choudhury constructed it after a Kachari person informed him about the existence of Devi Kamakhya Temple in the area. He first refused to believe it but when the Devi herself appeared in his dreams, he decided to oblige by building the temple. Zamindar Prithiram Choudhury donated 360 bighas of land for the temple. He also brought the first priest from Rongpur district of Bangladesh for the temple. “However, during the land settlement of 1919 by the British Government, the descendants of the priest’s family registered only 30 bighas of land in the name of the temple and the remaining land they occupied,” alleged Khandakar. Khandakar informed that Susanta Biswa Sarma, brother of Assam Health and Finance Minister Himanta Biswa Sarma has personally donated a building inside the temple campus worth Rs 16 lakhs. An additional amount of Rs 5 crore has been sanctioned by the Government and a 200 metre boundary wall and a pond has been constructed with the amount. Every year, devotees from all over Assam visit the temple which is believed to be very sacred. There are no idols inside the temple except for two or three stone sculptures shaped like naval which symbolises the navel of Sati.